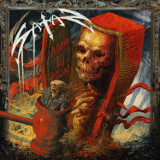 After a much shorter wait than the thirty years we endured for a followup to their 1983 classic, Court in the Act, Satan's produced another album with similar qualities to the one we saw two years ago, a good omen indeed. Now that the band's original lineup is back in action, the strength of their new albums make them seem like the product of a much younger and more enthusiastic band; where their peers' recent albums often seem rather stale (the latest Judas Priest and Iron Maiden albums are a prime example), Satan's last album was just as fresh and strong as Court in the Act. And just like its predecessor, you could listen to their newest, Atom by Atom, and not be blamed for thinking it was made somewhere between 1980 and 1983. Maybe part of that freshness is really just the timelessness of their sound. Like the previous albums, Brian Gross sings in a high, clean voice (starting with a long scream on the first track) with a vibe that is somehow very British, reminding me a bit of Ian Gillan's from his early days with Deep Purple, complete with the screams that he effortlessly tosses in. But Atom by Atom seems even more complex in its picking than the last album. The old-fashioned overdriven guitars are complex and blazingly fast, with way more of a thrash element than most NWOBHM bands ever had. If all the riffing candy and solo duels weren't attractive enough, the deal ought to be sealed by the fact that they can also write catchy -- though quirky -- songs. Farewell Evolution and The Devil's Infantry are both filled with odd chord changes that the lightning pick-work dances over in a seemingly effortless rattle of notes. The chorused vocals are still there, and occasionally Gross gets a little too soft for me to completely like, but there really aren't a whole lot of drawbacks to the album. In keeping with their past imagery of trials and courtrooms, which can also be seen on the cover, In Contempt slows the overall tempo slightly (but not the picking speed) to offer the listener a song about a one-sided trial where the outcome is never in doubt, as well as a rather dramatic bridge riff. Like this track, the album's overall conception is of final and well-deserved doom, from which humanity cowers or mindlessly walks into, following its own self-destructive tendencies and assisted by its technological creations -- but the way guitarists Steve Ramsey and Russ Tippins play, that fate isn't approaching slowly but at breakneck speed. Ahriman's portrayal of an Antichrist-like figure neatly combines conspiracy-theory lyrics with a slower but driving beat, and Bound in Enmity's creeping melodic picking, giving way to some absolutely furious guitar work, are standouts, but the band has saved what may be the best for last, because the really epic track in my opinion is The Fall of Persephone. Mournful and doomy without being particularly slow, the song quiets down in the middle for Gross to narrate in a grim voice with a hopeless-sounding choir following it, as it gets faster and faster to end with a final scream. Atom by Atom shows that Satan's long-hoped-for revival in their last album isn't fading away any time soon. The aggression of this album is a hard thing to pull off in an era where death metal vocals and heavy distortion would be a quicker way to get a heavy sound, but here Satan proves that clean vocals and simple, overdriven guitars -- in experienced hands -- are just as effective at leaving their listeners with headbangers' whiplash.